Norris is an elegant & super-clean one page WordPress theme for corporate, agency, business, personal and organizations. Norris not only has an eye-catching design with all modern standards: Responsive, Retina-ready, Translation ready, HTML5 & CSS3 but also contains everything you need to build an amazing one-page site. 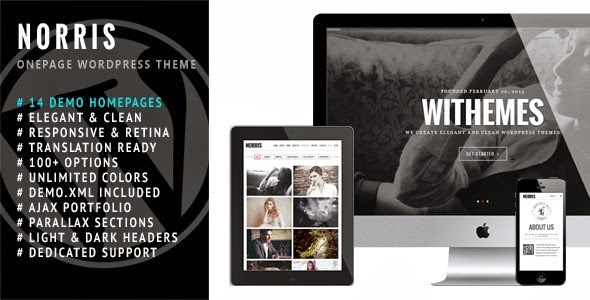 Item Reviewed: Norris - Responsive Elegant One-page WordPress Theme 9 out of 10 based on 10 ratings. 9 user reviews.